Today, nearly 18 months since the start of the post-referendum negotiations process between the Government of Sudan, or GoS, and the Sudan People’s Liberation Movement/Government of the Republic of South Sudan, or SPLM/RSS, the two parties, and the greater international community find themselves at a cross-road as tensions escalate between Khartoum and Juba and war, at times, seems more like a probability than a possibility. Since June 2010, the African Union High Level Implementation Panel, or AUHIP, led by former South African President Thabo Mbeki, has facilitated the “Post-Referendum Arrangements Negotiations” between the GoS and SPLM. Following South Sudan’s independence on July 9, 2011, negotiations have continued between the GoS and the SPLM/ RSS. In a new report, “Negotiations between the Two Sudans: Where They Have Been, Where They Are Going,” the Enough Project examines the proposals laid out by the AUHIP, the SPLM/RSS, and the GoS during the last round of negotiations held last month in Addis Ababa, Ethiopia. The report indicates that although the SPLM/RSS made significant concessions this time around, the GoS demonstrated a lack of political will to negotiate. While the two parties remain far apart in their positions on three key issues—transitional financial arrangements including oil-related fees, the status of Abyei, and border management—a package deal addressing all three of these remains the only feasible endgame. The report provides a series of concrete recommendations concerning the future engagement of the AUHIP, U.S., and other relevant international actors including: China, Ethiopia, and the Sudan Troika which consists of the U.S., U.K. and Norway In relation to the negotiations’ facilitators, the A.U. panel must focus on achieving a comprehensive agreement between the parties, rather than following the inconsistent approach it has been pursuing, which has yielded few results. To this end, relevant international actors must support the negotiation process through a concerted mechanism that would both pressure the GoS to play a more constructive role, as well as support the AUHIP’s ability to bring the parties together. The removal of the state sponsor of terrorism designation, the lifting or expansion of the current sanctions regime, and support behind debt relief for Khartoum are viable tools that can be applied when needed during the negotiations. However, these tools should not be employed to advance a North-South deal alone. 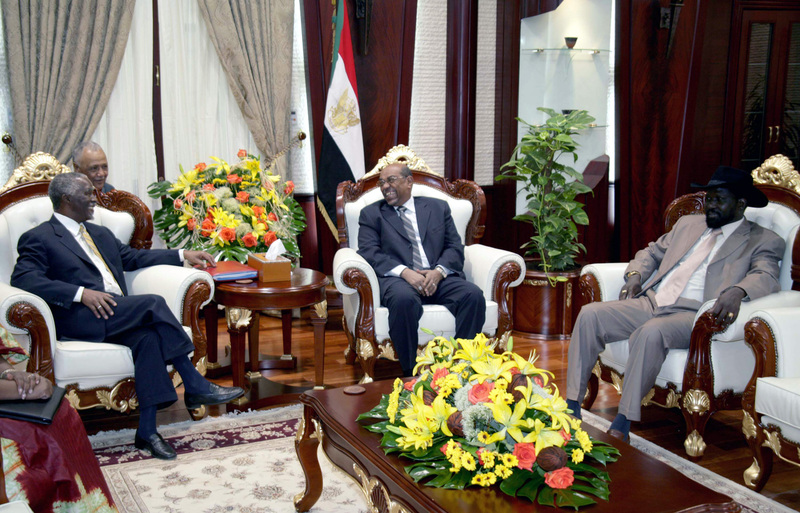 Rather, the U.S. should actively pursue a carrot and stick approach with Sudan that encompasses both the North-South negotiations and the promotion of a comprehensive peace agreement within Sudan that leads to credible elections. Importantly, Enough also recommends that any economic assistance provided to the GoS in the context of the north-south negotiation process must be conditioned not only on the conclusion and implementation of a north-south deal, but also on the resolution of the north-north conflict, including, among other issues, the immediate cessation of hostilities towards civilian populations in Sudan and access for international humanitarians throughout Sudan.